I felt a little bad Sunday after we went up to my sister-in-law’s vet’s office to look at kittens that needed a home and then left without one (If you didn’t read my last post you can find it here). 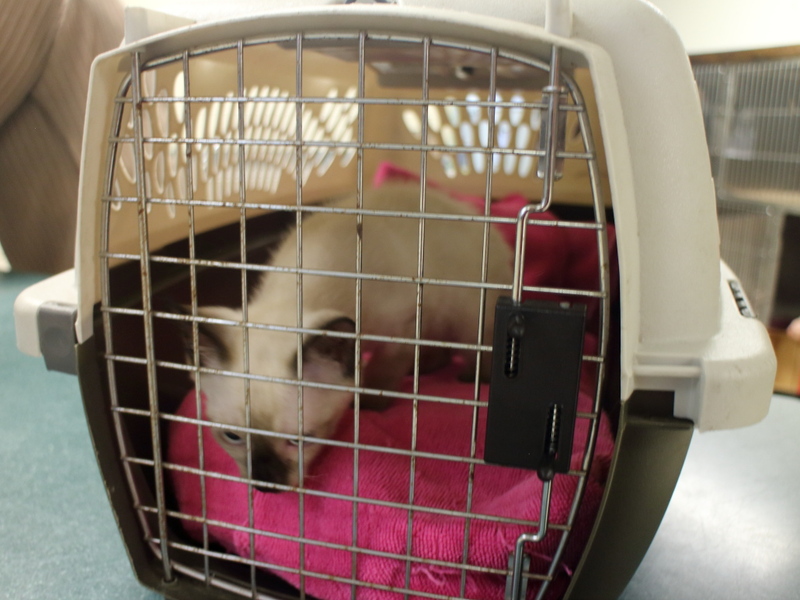 Rose felt bad too and called her sister and asked about seeing the second male Siamese kitten. When she arrived, Felice put a ribbon around the neck of the fixed cat so we wouldn’t confuse them and then took both kittens out. The big gold cat was there to greet us again and was a little bit like Baby Huey. 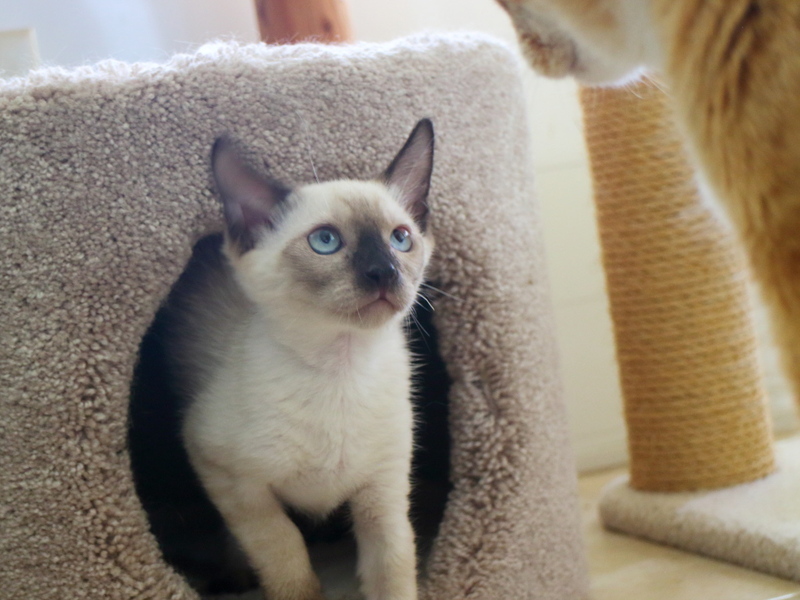 After checking out both kittens, Rose came to realize that the first kitten we saw was the better choice and he was not sickly like she first thought. It was like she was seeing him for the first time and was convinced he was the one, so we put him in the carrier and headed home after briefly considering taking his brother too. Of course, we knew we were pushing the limit with four cats, especially since we are only allowed two. On the way out we had to pass by this scene, which was very hard to do. We were happy to hear that this girl’s potential adopter is not as bad as we thought. While she will be an outside cat, we were told that she will be living on a farm with other outside cats that are well taken care of. Apparently, there is a part of the barn that is set up for them. I sometimes think Frankie might be happier living in a place like that where he can come and go as he pleases. I then see him lying upside-down on our bed and I think maybe not. The kitten cried almost all the way home, and it was a long trip. I heard Siamese cats are very vocal and this confirms it. I thought introducing a kitten would be less stressful for our cats because kittens are not a threat. I noticed when we introduced Puck, a kitten, Chris was happy to have him but when we got Frankie, an adult cat, Chris was not happy about that. This time Chris and Puck did a little growling at the kitten but were mostly tolerant. Frankie, however, wanted the kitten gone. He spent his time hissing at him and trying to whack him. Fortunately, the kitten was small enough to get into places where Frankie couldn’t reach him. I wanted to tell the story in one post but preparing the pictures and videos is time-consuming, and I have very little spare time these days. I will finish this tomorrow, hopefully. I will say that as I write this, Frankie is mostly over being mean to the kitten but he is still jealous and needs attention. 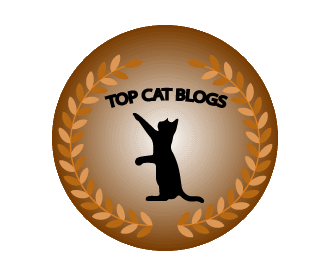 This entry was posted in Uncategorized and tagged adopt, cute, kitten, Siamese on July 6, 2016 by Charles Huss. He slept with us the last two nights. I think that needs to stop before it becomes a problem. Also, I published this post and it didn’t include the last paragraph and a photograph for some reason. You might want to look again in case you missed it. I always wished Sammy would sleep with us but he never has! Go figure…..if you want them there they aren’t interested – and if you don’t want them there they won’t bother! Your little guy probably is lonely….. (sniff sniff). 🙂 On my way back to see more of your post………. I hope soon one of the other cats will nap with him. You can’t save the world. You can only save your little corner of it. You have a baby in the house! Floki is soon part of your cat band, maybe the noisiest one. Too precious! Congrats to you on your new kitten. what a cutie…. it is funny, even here, regardless of the number of kittens we have fostered, it can be hit or miss with the adults. You would think they would be used to it. Just adorable!!!!!!! Wishing you worlds of happiness!!!!! I am sure everyone will adjust sooner than later! Floki is adorable! Thanks, Summer. Things are much better today but not perfect yet. I just need to make sure I pay attention to everyone. floki….a most happee gotcha day two ewe small dood; welcome home; welcome two de interwebz ~~~~~~ itz veree nice two meet ewe ♥♥♥ yur videe ohz rock…984 paws UP !! Aaaaaaaw He’s a cutey. And what a set of lungs he has. MOL Glad things are going well. And yes, kittens are much easier to transition with adult cats. Thanks. Things are going well now. Congratulations on your new baby! Floki is a cutie. I am sure everyone will get along eventually as long as you take it slow. Thank you. I have hope. Aw, Floki is adorable. We hope everybuddy learns to get along. It’s best to take introductions slowly. Floki is adorable! I hope he settles in nicely. Floki is a sweetie… sure hope Chris, Puck and Frankie sort things out soon. -Katie Kat. Thank you. They get better everyday. Slow to us as letting him stay in the carrier for 2 minutes before opening the door. The sure do impact our lives and we miss them when they are gone.